Any World Cup podium result is impressive, but for Canadian skier Larisa Yurkiw, two podium finishes so far this season have particular significance given her decision to ski as an independent athlete. Before Christmas, the 27-year-old downhiller from Owen Sound, Ontario, finished 3rd at Val d’Isère. 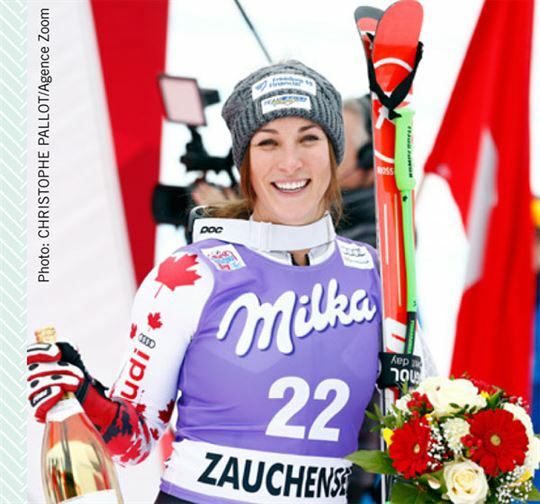 And she started the new year with a silver medal at Altenmarkt-Zauchensee, just behind Lindsey Vonn. We’re all watching a little closer now. A chain of events that began prior to the 2010 Vancouver Olympics resulted in Yurkiw deciding in April 2013 to drop Alpine Canada and go it alone. Unwilling to walk away from her dream, Yurkiw instead formed Team Larisa. She hired a coach and raised enough money to train as an independent. She qualified for the 2014 Sochi Games, finishing 20th, then earned her first World Cup podium with a 2nd at Cortina d’Ampezzo in January 2015. Yurkiw estimates it costs an average of $250,000 a year to compete on the World Cup.